Bike Racing 3D is the No.1 BMX game with insane and stunt action! Bury the competition as you drive through a variety of treacherous tracks while enjoying the realistic bike physics and fast-paced gameplay. Bike Racing 3D is easy to pick up but hard to master which will keep you in the zone for hours. 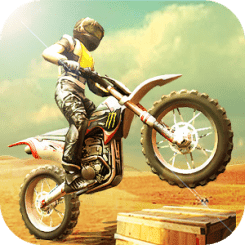 Race, jump and crash your way and rivals through the amazing tracks as you master the physics of motocross in this high speed racing adventure. Here is your chance to step up and prove that you are the most intense and competitive biker!